You can target your donation by sponsoring a dog. This also means that you get to name the lucky pup! Training a service dog for an individual requires several months of intensive training, as well as specialized medical testing and screening. Scholarships for eligible clients in need of funding sources to pay for their fully trained service dog. Six to nine months of advanced instruction for the service dog-in-training. This advanced training occurs after the canine has successfully completed our 8–10 week basic obedience program. A customized, one-on-one two-week Partnership Training Program developed for a client and their new service dog. All veterinary services and screening exams, which include hip and elbow x-rays, specialized eye exams, wellness checkups, and vaccines. Program expenses including food and treats, collars and leashes, service dog jackets, KONG crates, monthly flea and heartworm medications, grooming and training supplies, and instructor fees. Once a canine candidate has completed our advanced program, our client and service dog-in-training participate in a customized, one-on-one two-week Partnership Training Program. The client and dog will learn how to listen to and respond to each other’s needs; this is essential in becoming a successful working team. Our client will learn how to confidently communicate a minimum of 50 commands while their canine working partner learns how to anticipate and respond to their person’s needs. Some of our shelter dogs are selected for advanced training because they demonstrate the qualities necessary to become a potential service dog for one of our clients. During the six to nine-month training program, we teach the dog advanced commands while evaluating their comfort and aptitude for their life of service work. Your donation will help defray the cost of this specialized training for one month. After we evaluate and select dogs from a local shelter, they are brought into a local correctional facility to participate in the 8-10 week basic obedience training program. 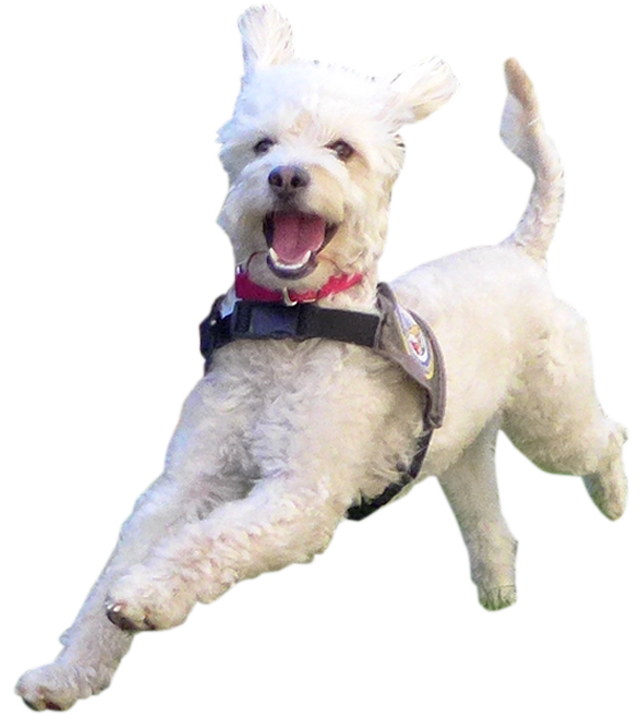 Your donation pays for all the expenses associated with one canine participant in a training cycle. Expenses include food and treats, bedding, toys, monthly flea medications, and instructor fees. Every time we rescue a dog from a local shelter, we must pay the shelter fees. Those fees include spay/neuter surgery, vaccinations, microchips, licenses, and adoption fees. Your donation will cover these costs, in addition to the food expenses for one dog during one training cycle.